At the point where the Caribbean meets South America on its North Atlantic seaboard lies an almost unknown, but incredibly wonderful land of unspoilt beauty, where the virgin rainforest leads to the Amazon Basin. Where the jungle is still unexplored, rivers uncharted and mountains yet to be climbed.” Guyana is situated on the north- eastern coast of the continent of South America between l degree and 9 degrees north latitude, and 57 degrees and 61 degrees west longitude. It is bounded on the north by the Atlantic Ocean, on the east by Suriname, on the south and southwest by Brazil, and on the northwest by Venezuela. Its coastline stretches for some 270 miles and it extends inland for about 450 miles. About 35 percent of the country, the area approximately below 4 degrees north latitude, lies within the Amazon Basin. Guyana Standard Time is four hours behind Greenwich Mean Time and one hour ahead of Eastern Standard Time. (GMT-4). The area of Guyana is 83,000 square miles (215,000 square kilometers), which is slightly larger than the state of Idaho or slightly smaller than the United Kingdom, excluding Northern Ireland. Situated in the tropics, Guyana has an equatorial climate. But on the low lying coast lands where most of the people live, the northeast trade winds have a moderating effect, creating a pleasant climate throughout the year. On the coast lands, the temperature ranges from 68 to 91 degrees Fahrenheit with a mean shade temperature of 80 degrees Fahrenheit, while in the interior regions it ranges from 61 to 102 degrees Fahrenheit with a mean of 82 degrees Fahrenheit in the shade. There are two marked rainy seasons during the year -a long rainy season from April to August and a short rainy season from November to January. Annual rainfall varies from about 90 inches on the coast to as much as 140 inches in the rain-forest areas. But in the savannahs where the dry periods are more prolonged, the average is only about 60 inches, with most of the rainfall occurring during the months of May to August. 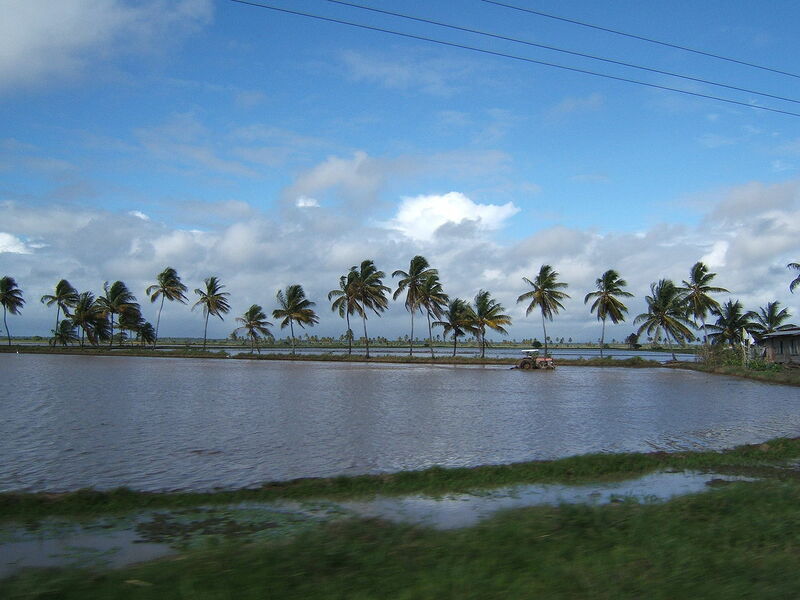 Guyana is not affected by hurricanes, tornadoes, earthquakes or volcanoes. Guyana’s resources for eco-tourism development are receiving wide and growing recognition, and travel writers frequently remark upon the uniqueness and natural beauty in which the country abounds. Guyana possesses four mountain ranges, 275 waterfalls, 18 lakes, and vast areas of tropical rainforest, much of which is still in a pristine state. The forest is home to a rich and rare assortment of flora and fauna that makes Guyana a natural museum for the eco-tourist yearning for contact with raw nature. Guyana is home to over 700 native species of birds. These species include the Harpy Eagle, the largest eagle in the world; the Toco Toucan, famous in the bird world for having an enormous beak almost as large as the rest of its body; the Scarlet Macaw, one of the world’s most enchanting colorful birds; or the red-billed Toucan, whose loud call announces an imminent downpour of rain. Guyana’s main attraction, remains the Kaieteur Falls (See picture) with its giant 741 feet ensemble of water mist, rainbow colors and supernatural roar. It is five times the height of Niagara Falls. About 730,000 people live in Guyana. About 90 percent of the population inhabits the narrow coast land area (The picture shows a pathway through a typical coastal village). However, the indigenous inhabitants, the Amerindians continue to live in the savannahs and the highland region.Considering the population of age 5 and above, the overall literacy rate is 98 percent. Guyana is often referred to as the land of six peoples, reflecting the multi-ethnic composition of its population. The largest ethnic group is the East Indians (about 51 percent), descendants of indentured laborers from India, followed by the Africans (38 percent). The other ethnic groups are the Chinese, the Europeans (mostly Portuguese) and the Amerindians. The Portuguese came as indentured laborers from Madeira, the Azores and Cape Verde. During the colonial era, they were regarded as a separate group from the other Europeans (mainly British), no doubt because of their origins as indentured laborers. This practice underlines the notion of six peoples. There is also a large racially mixed group. About one-third of the population lives in towns. Georgetown, the capital, is situated on the coast, on the right bank of the Demerara river, one of the three main rivers flowing into the Atlantic Ocean. Other important towns are Anna Regina, Corriverton, Rose Hall and New Amsterdam, all located along the coastline, and Linden, a bauxite mining town, about 65 miles inland on the Demerara River. The official language of Guyana is English. Creolese, an English-based creole, is widely used as a language of informal communication. The Amerindians have maintained their many dialects. Hindi and Urdu are used almost exclusively for religious purposes by Hindus and Muslims, respectively. Guyana is a secular state with religious freedom guaranteed to all under the Constitution. The three main religions are Christianity, Hinduism and Islam. Guyana’s early history is reflected in the many Dutch and French place names throughout the country and in many words commonly used. Its history is also reflected in traces of Roman-Dutch law in the legal system of the country. Guyana is a member of the Commonwealth, the Caribbean Community (CARICOM) and is the only English speaking country on the South American Continent. Georgetown Georgetown, the capital city has an estimated population of 183,000 and is situated at the mouth of the Demerara River on its eastern bank. It is often described as the “GARDEN CITY OF THE CARIBBEAN”. The city is below the high water mark of the spring tides of the Atlantic Coast. The ocean is kept out by a massive wall forming a breezy esplanade on the sea front and by river and wharf walls on the river front. The streets of the city are laid out at right angles to each other. The checker board layout of the city is a heritage from its Dutch past. The town which eventually grew into Georgetown, was first named Stabroek by the Dutch and several Dutch names are still in use. Today, it is a picturesque city with broad tree lined avenues and many noble buildings including some handsome wooden dwelling houses of architectural interest and the conical Amerindian Benab – the Umana Yana.